Bael Fruit - What Should You Know About It? Bael fruit is a sweet, aromatic fruit that grows on the bael tree (Aegle marmelos) native to India and southeast Asia. The fruit is typically eaten fresh, dried, or in juice form. Proponents suggest that consuming bael fruit can help treat certain health conditions, including digestive disorders. Bael fruit contains a number of substances that may affect health. These substances include tannins, a class of compounds with anti-inflammatory effects. Bael has a long history of use in ayurveda. Unripe bael fruit, for instance, is used for digestive disorders (including diarrhea). 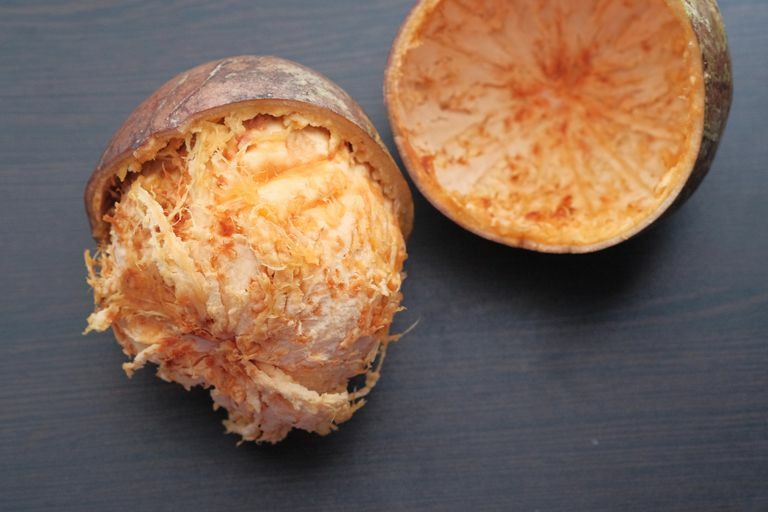 Ripe bael fruit, meanwhile, is said to have laxative effects. Unripe bael fruit may help treat diarrhea, according to a study published in BMC Complementary and Alternative Medicine in 2009. In laboratory experiments, the study's authors observed that extracts of unripe bael fruit pulp possess antibacterial properties that may help fight diarrhea caused by bacterial infection. Unripe bael fruit may help protect against inflammatory bowel disease (a class of conditions that includes Crohn's disease and colitis), suggests a study published in the Indian Journal of Pharmacology in 2012. For the study, a group of rats with colitis were treated with an extract of unripe bael fruit. Results revealed that the extract may help to reduce intestinal inflammation, a key marker of inflammatory bowel disease. Due to a lack of research in humans, little is known about the safety of long-term or regular use of dietary supplements containing bael fruit. However, there's some concern that bael fruit may trigger side effects, such as low blood sugar and stomach upset. Bael leaf contains aegeline, a substance that has been associated with severe liver injury, liver faillure, and death. A dietary supplement containing laboratory-produced aegeline was linked to 114 reports of adverse events, with 48 percent of the reports describing liver disease, 60 percent involving hospitalization, and 3 percent involving required liver transplantation. While the exact cause of the adverse events aren't known, medical experts stated that they were almost certain that aegeline was responsible. Aegeline may also appear on the label as N-[2-hydroxy-2(4-methoxyphenyl) ethyl]-3-phenyl-2-propenamide. According to one small study, bael contains compounds shown to disrupt the function of the body's cells. The researchers stated that these types of compounds (which are relatively common in plants) may have the potential to induce liver damage, neurodegeneration (the progressive degeneration of nerve cells), and other adverse effects. Bael fruit contains substances that may affect the way drugs are processed by the body. If you take medication or supplements, be sure to speak with your doctor before taking bael fruit. There is some evidence from preliminary animal studies suggesting that aegeline may lower blood sugar levels. Keep in mind that supplements haven't been tested for safety and dietary supplements are largely unregulated. In some cases, a supplement may deliver amounts that differ from the specified amount on the label. In other cases, a supplement may have undeclared ingredients or be contaminated with other substances. A bael fruit product, for instance, may contain compounds from other parts of the plant. Also, the safety of supplements in pregnant women, nursing mothers, children, and those with medical conditions or who are taking medications isn't known, so it's best to avoid use. Bael shouldn't be taken within two weeks of a scheduled surgery. You can learn more about using dietary supplements here. Several other remedies are known to contain tannins (one of the types of compounds said to play a key role in bael fruit's health effects). These remedies include mangosteen, black tea, green tea, and cranberries. If you're seeking natural relief of diarrhea, speak to your healthcare provider about such remedies as probiotics or chamomile tea. Bael fruit is typically consumed in small amounts as a fruit. Due to the limited research and lack of evidence for safe use, bael supplements should not be taken as a treatment for any health condition. It's important to note that treating a condition with bael supplements and avoiding or delaying standard care may be very harmful to your health. If you're considering using it, make sure to consult your doctor first. Get nutrition tips and advice to make healthy eating easier. Behera JP, Mohanty B, Ramani YR, Rath B, Pradhan S. Effect of aqueous extract of Aegle marmelos unripe fruit on inflammatory bowel disease. Indian Journal of Pharmacology. 2012;44(5):614-8. Klontz KC, Debeck HJ, Leblanc P, et al. The Role of Adverse Event Reporting in the FDA Response to a Multistate Outbreak of Liver Disease Associated with a Dietary Supplement. Public Health Reports. 2015;130(5):526-532. Brijesh S, Daswani P, Tetali P, Antia N, Birdi T. Studies on the antidiarrhoeal activity of Aegle marmelos unripe fruit: Validating its traditional usage.BMC Complementary and Alternative Medicine. 2009;9(1). Is Barley Grass Good for You? Can Mangosteen Improve Your Health?